The first College Football Playoff rankings will be announced tonight (6 p.m. – ESPN) and the Wisconsin Badgers aren’t spending a whole lot of time worrying about where they stack up. In fact, they’re not spending any time at all. The Badgers (8-0, 5-0 Big Ten) are ranked No. 4 in both the Associated Press top 25 poll and the Amway coaches poll and will face the Indiana Hoosiers (3-5, 0-5) at 11 a.m. Saturday in Bloomington. Chryst’s players all echo their coaches thoughts. They say they’re not interested and won’t watch the show tonight or any other night. Left tackle Michael Deiter said the only time he would be interested in watching is after the Big Ten Championship. Until that point, they need to control what they can control and that is the matchup against their weekly opponent. The Badgers haven’t faced a ranked team yet this season and that usually doesn’t bode well when it comes to the National Playoff rankings. But instead of losing sleep over it, the players are focused on winning each game each week. The Badgers are now the only unbeaten team in the Big Ten and they’re hoping it stays that way following Saturday’s game at Indiana. Jack Cichy (Photo by David Stluka). Wisconsin senior inside linebacker Jack Cichy will miss the 2017 season after suffering a torn anterior cruciate ligament in practice on Tuesday. Cichy is schedule to have surgery on Friday. The Somerset, Wisconsin, native earned All-Big Ten honorable mention last season despite missing the Badgers’ final seven games due to injury. In his seven starts, Cichy recorded 60 tackles, 7.0 tackles for loss and 1.5 sacks. 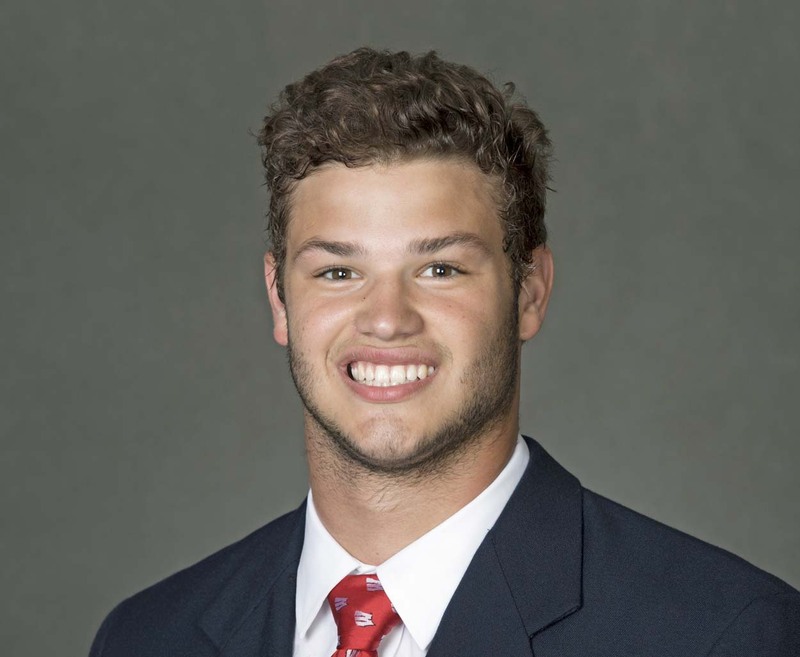 The former walk-on was voted a team captain for the 2017 season. He also was placed on watch lists for the Bednarik Award, Butkus Award, Nagurski Trophy and Lott IMPACT Trophy this preseason. 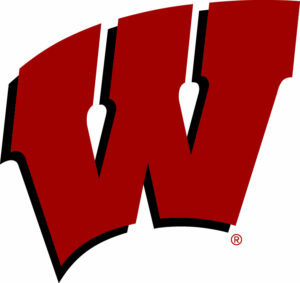 The White (defense) edged the Cardinal (offense), 20-17, in Wisconsin’s annual spring game on Friday night at Camp Randall. Linebacker Griffin Grady led the defense with nine tackles and cornerback Ceasar Williams added an interception. Three different Badgers, Garret Rand, Isaiahh Loudermilk and David Pfaff, recorded sacks. Offensively, quarterback Jack Coan went 10 of 17 for 121 yards and a touchdown for the Cardinal. Kare Lyles went 2 of 6 for 16 yards. The Cardinals lone touchdown came in the closing seconds as Coan found tight end Zander Neuville in the end zone on a 8-yard pass. Kyle Penniston led the Badgers with three a catches for 33 yards. The Wisconsin Badgers cap off spring workouts with their annual spring game tonight (6:30 p.m.) at Camp Randall Stadium. 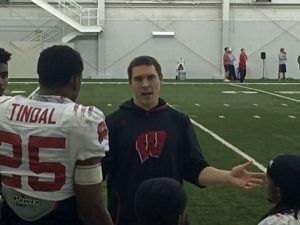 The Badgers have been able to build depth all over their roster with several starters were either limited or held out while recovering from off-season surgery. But everyone loves to focus on the quarterback position. Alex Hornibrook started all nine Big Ten games as a redshirt freshman in 2016. He battled Bart Houston into the final week before the start of the season last year before finally winning the job. 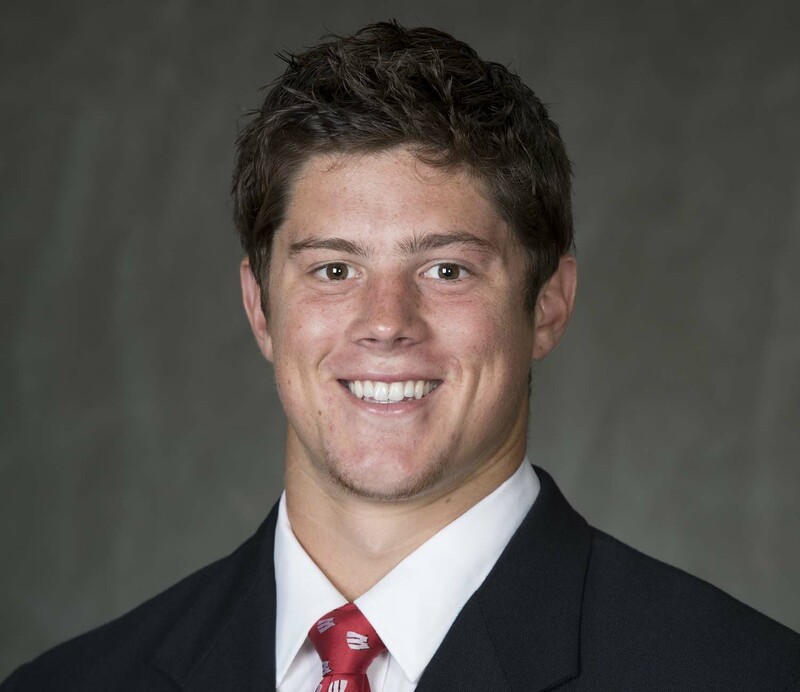 All of that experience has landed Hornibrook the job for this season. The position was handed to him during offseason workouts. Last year, Wisconsin didn’t name it’s starting quarterback for the season until days before the opener against LSU at Lambeau Field. Even though Alex Hornibrook started all nine Big Ten regular-season games as a redshirt freshman, he still shared some playing time with senior Bart Houston. But Hornibrook, who completed 58.6% of his passes for 1,262 yards with nine touchdowns and seven interceptions, was quickly named the number one man for this season. Kare’ Lyles will be a redshirt freshman in the fall, and freshman Jack Coan is a newcomer. They are Hornibrook’s backups. Jim Leonard coaching his players during practice at Green Bay’s Don Hutson Center. 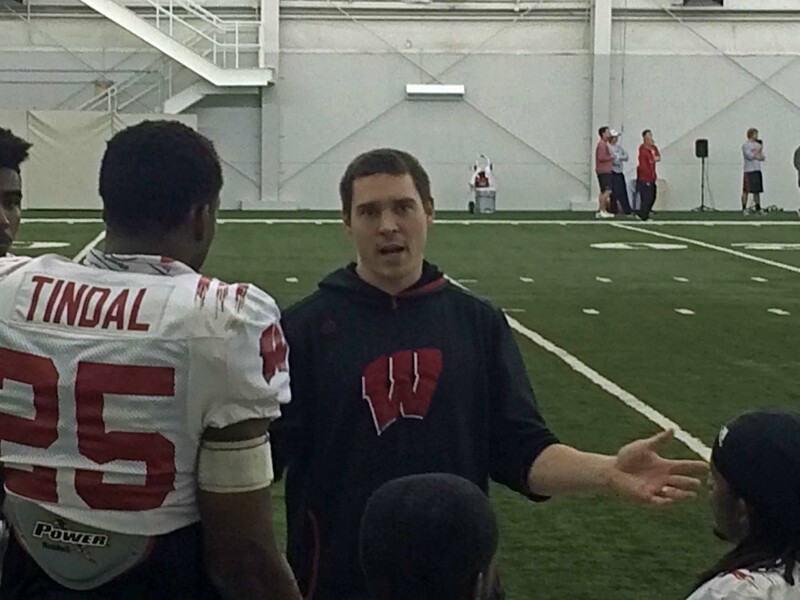 The Wisconsin Badger football team has hired former Badger standout Jim Leonhard as the teams new Defensive Coordinator, replacing Justin Wilcox, who took the head coaching job at California after just one season in Madison. 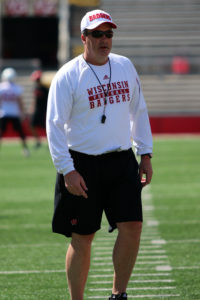 Leonhard served as Wisconsin’s defensive backs coach last season and his impact on the Badgers’ secondary was immediate. His unit was instrumental in the Badgers collecting 22 interceptions, a total that ranked second in the FBS. 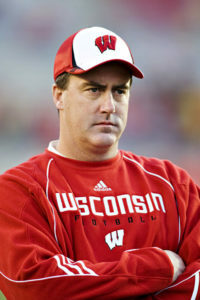 It marked Wisconsin’s highest output since 2002, when Leonhard himself recorded a school-record 11 of UW’s 22 picks. Wisconsin’s 2017 recruiting class is made up of 19 scholarship players. Of the 19, four are wide receivers and four are offensive linemen. One of the strengths of the wide receiver group is Danny Davis, from Springfield, Ohio. He announced Wednesday afternoon that he decided to attend Wisconsin over West Virginia and Kentucky. The 6’3, 190-pound Davis also had offers from Nebraska, Michigan State, Iowa, Penn State, Northwestern and Cincinnati. The Badgers lose wide receiver Robert Wheelwright to graduation. They also added Texas wide receivers Emmet Perry (Desoto) and Cade Green (Austin), as well as Deron Harrell of Denver.